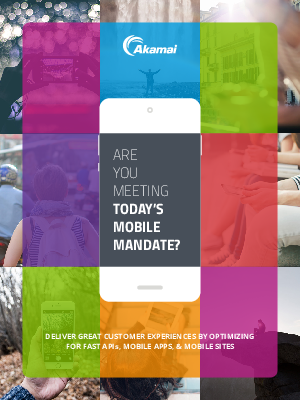 > Akamai Technologies > Are You Meeting Today's Mobile Mandate? The rapid rate of mobile adoption provides today’s users with nearly unlimited access to data and information anytime, anywhere. While “always on” users represent a tremendous opportunity for businesses to increase engagement, revenue, and customer loyalty, they also create unprecedented mobile delivery challenges. In this e-book, we will delve into these challenges and learn how to master them by optimizing for fast APIs, mobile apps, and mobile sites. But, before we do that, let’s start our mobile story with some perspective: approximately half of you reading this e-book will do so on mobile. That fact alone should be a compelling enough reason to keep reading, but in case it’s not, the following data illustrates the impact mobile growth has had on our technological landscape.